Drake's View - Luxury Villa with Stupendous Views-Great Rates! Welcome to Drake's View, St. John, US Virgin Islands. Drake's View has the same vista named by the magazine Caribbean Travel as 'the best view in the Caribbean'; a spectacular view of the British Virgin Islands and the East Shore of St. John. The villa has been voted 'Top Vacation Rental' for two years in a row now. Drake's View is a four bedroom, 4.5 bath villa with a heated swimming pool, and hot tub. Five tiled decks and a large tiled front porch provide ample outdoor lounging areas. One bedroom is in a separate cottage. The traditional architecture of the house entrance with yellow stucco, red roof, and simple columns contrasts with a dramatic facade of glass along the east wall. No matter where you look in the house or cottage, you have a fantastic vista of Coral Bay, Drake's Passage, and the British Virgin Islands. On a clear day, you can see the Baths at Virgin Gorda. Rainbows, mangrove cuckoos, kestrels and red tailed hawks are common sights. Drake's View has the ambiance of a home rather than a rental. The large great room is furnished with Indonesian, American antiques, and comfortable, plantation style furniture. The villa is filled with local art and a large reef painting and mobile by Robert Tharsing. The well equipped kitchen is very spacious and includes one of two dining areas. Three bedrooms have king sized beds and one has a king, convertible to twins. Each bedroom has air conditioning, private bath and Swedish TempurPedic mattresses. One to four couples or a large family will have ample room for privacy, different activities,and for relaxation at Drake's View. Drake's View is centrally located, on Bordeaux Mtn., the highest point on St. John. The roads leading to Drake's View are all paved. It is surrounded by lush local vegetation and a large, terraced tropical garden with lime, coconut and mango trees. It is a six minute drive to the Northshore Beaches; three minutes to the Reef Bay Trail; ten minutes to Coral Bay; and fifteen minutes the Cruz Bay. From the front door, you can hike the Bordeaux Mountain Trail to Lameshur Beach in one hour. St. John has fabulous snorkeling, diving, and hiking. The snorkeling is among the best in the Caribbean. Since 2/3 of the island is National Park, many beaches have amenities but no developments mar the expanse of sand and palms. From St. John, it is easy to take day trips to visit other islands such as the popular yachting destinations of Tortola, Jost Van Dyke, Virgin Gorda, Peter, and Norman Islands. The Park Service also offers snorkeling tours, hikes, birding tours, sails, archaeological digs, and lectures. Numerous park trails lead to stone ruins of old sugar mills and plantations, petroglyphs, and even waterfalls if rainfall is plentiful. St. John is reached from St. Thomas via a twenty min. ferry ride. St. Thomas is primarily serviced by Delta, American, US Air, United and Continental Airlines from the states. We have been traveling to St. John for over thirty years, and our children have come with us since they were born. St. John is home for us: the moment we stepped on the island in the 1970s it just felt right, and we've been coming back every year since. We look forward to sharing our dream home with you! We fell in love with the Bordeaux Mountain site for Drake's View because of the breathtaking views. We knew that we would build on the site as soon as we saw the vista from this incredible spot(it used to host a hang gliding launch pad!). The villa is located in a perfect central location on the island: close to both the ferry dock and restaurants in downtown Cruz Bay, and to the more relaxed vibes and great snorkeling in Coral Bay. Drake's View has the view voted by Caribbean Travel Magazine as 'the best in the Caribbean,' and ample patios and terraces from which to enjoy the vista, stargaze, and enjoy the sunset. Drake's View has incredible terraced gardens on site, great birdwatching, and is walking distance from the famous Reef Bay Trail and other hiking on Bordeaux Mountain. It is a short drive to both the North Shore beaches (5 min. to closest beach) and the more secluded beaches on the East End. Also, unlike some beach-side rentals which are often buggy and hot, Drake's View is blessed with a constant breeze! All bathrooms are equal and have a tile shower, plenty of cabinet room and hairdryers. A/C in Bedrooms. Overhead fans in all rooms. 3-4 cars are easily accomodated. fully equipped kitchen with blender, coffeemaker and coffee grinder. There is a gas range. There is a dining table for eight in the kitchen area and a formal dining table near the semicircular balcony. Great for stargazing or sunbathing. There are 5 patio areas, including the pool. The cottage with a king BR has a private terrace. Ample outdoor patios provide private areas for individuals. These are in addition to the 3,750' of indoor living space. Heated 20 x 12'' pool. Stunning views and impeccably maintained! As repeat guests of Drake's View for several years, we feel very much at home there and will be returning again next year! The photos really don't do this home justice because it's close to impossible to capture the feelings obtained at this house in a photo, even in a video. I've been coming to St. John for 30 years. I've rented mostly in the Carolina area. I've always heard you don't need air conditioning in Bourdeaux. You really don't. The wind is magical, just like the view, just like the home. Thank you for sharing your beautiful home with everyone. What a gift. We are so glad you enjoyed Drake's View and it's spectacular view. St John seems to choose it's visitors and I hope you return to explore more of the island. This was my 5th trip to Drake View! In the past mu husband and I have had a blast renting this house with 3 other couples. This trip we had a blast with our son and dear family friends with their 3 sons! Everyday new adventures and great finds! The home and property are LOVELY! The owners do a fabulous job keeping up with the house and and lush gardens ! We enjoyed the brand new hot tub daily ! Many more new restaurants, Along with going back to our many favorites! Zoe Zoe's is a 10 along with Drakes View! Thank you so much for the great review. We always look forward to hearing about your adventures in St. John. We love that guests teach us new things things about the island and house each time they come. We look forward to you coming back soon . Thank you for sharing your amazing home with us and our friends. It is beautiful and was the perfect villa for 4 couples. My husband and I traveled with 3 other couples for a week to celebrate our 30th wedding anniversary. Three couples stayed in the main house which offered them each a private room with a king bed and private bath. The main level allowed the group to hang out together, cook meals, party and chat. My husband and I stayed in the cute little house behind the main villa. It was so nice to have our own space for the week. The cool breeze at night allowed you to keep your windows open and sleep like a rock. Our friends that stayed in the Mango room said they have never slept better in the whole lives. All four bedrooms offer a view. The kitchen is spacious and completlely stocked with everything you need. We had a private chef cook for us the night of our vow renewal on Trunk Bay Beach and he only had to bring the food and ice. Plenty of serving dishes, plates, utensils, etc. I did bring table decorations and left them behind for the next group. The library has tons of reference books to help you navigate the islands and we enjoyed the photo album of the house being built. The driveway was large enough for 3 four door jeeps and the owners SUV. The location was perfect to travel back to Cruz Bay or down to Coral Bay and the other beaches. As for beach equipment there are coolers, chairs and noodles. Each room came with 2 beach towels and plenty of bath towels. I could go on and on forever. We had a wonderful week and would come back to Drake’s View. It was like heaven on earth. Thank you for your kind review. St. John is an island that chooses people. We are glad that you enjoyed the island and found the house comfortable. It is a great place for families and groups of friends. We hope you come back and explore more trails and beaches. We have been coming to St. John for 39 years and always see or do something new. Having learned a little bit about the island from my first trip to St John just 5 months before this trip, I knew that Drake's view was the best location for enjoying the island. The home is perfectly located for quick trips to the best beaches. If you are a fan of what St John is about, then you will love the restaurants in Coral Bay as well. The views from the home are so special. It is such a pleasure to be in the large living area where you can lounge, have coffee, all while enjoying the view, and the beautiful art work that surrounds you. The construction and care of this beautiful home is very impressive. We are very grateful the owners have opened their home for others to enjoy. The layout of the home is perfect for a large family. My friend and I took our combined family of four adult children and one youth. There was plenty of room! They all loved the home and the island! The privacy of the separate living quarters can not be understated! The views from this area are just as great as from the main home. There is also a large, private outdoor seating area connected to this separate suite. We enjoyed hiking, snorkeling, shopping, eating, and beach bumming! If you hike you must hike Ram's head. Snorkeling the beaches along this hike is amazing! If you enjoy snorkeling there isn't a beach that will disappoint. You will always see something! For beach bums, the fluffy white sand and crystal clear water at Cinnamon Bay and Trunk Bay will make you smile. We were all, even the vegetarians, very happy with the food at Cafe Concordia, Miss Lucy's, Skinny Legs, and Indigo! The carnivores in the group, also enjoyed buckets of chicken wings from Chester's Chicken. Chester's chicken is great to pick up after a long day of beach activity! 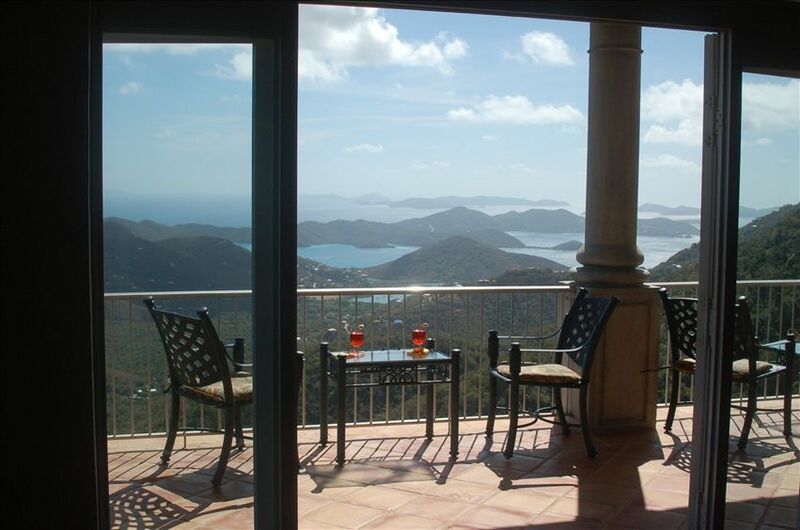 Drake's View is the perfect place for a group to enjoy the beauty and essence of St John! Thank you for the great review. Like you, we feel that St John speaks for itself. We love the beaches, the people and the beautiful ocean and views. We are so happy that you enjoyed your time at our house and share our interest. We hope that you come back soon. This is by no means your typical rental house!! It was our fourth time renting Drake's View and as always, we were not disappointed! In fact, it just keeps getting better. The view is absolutely spectacular and honestly, we forget how beautiful it is until we walk through the front door and look out the many windows and french doors, and it truly takes our breath away. The view is like no other and is visible from every part of the house as well when sitting in the hot tub or swimming in the pool. Each morning of our trip starts with coffee (or a diet coke for some!) on the porch looking out to Virgin Gorda and there is nothing more relaxing. The house is most comfortable and works for groups small and big, old and young. Each bedroom with its own bathroom provides privacy and such comfortable beds and surroundings. The living areas are beautifully decorated with furnishings like you would find in your own home and the art throughout the house is so unique. There is nothing more relaxing then to start the day with the amazing views, spend the day at one of the many beaches, and return to Drakes View for swimming, hot tubbing and an easy dinner in the lovely villa. The property grounds and the gardens are unbelievable and they certainly show that a lot of work has gone into making them truly a tropical paradise. They have grown so much since the first time we stayed at Drakes View and honestly, it is really hard to leave the house some days because sitting by the pool, reading a book on the porch or taking a nap on the hammock perfectly placed among the beautiful trees and flowers is already a vacation within itself! St. John is a special place to us with its many wonderful beaches, snorkeling, fabulous restaurants and the island life and atmosphere that make it such fun. However, we also know from having rented another place one of the five times that we have come to St. John that one of the MAIN reasons that we want to always come back is because of Drakes View. It truly provides us the ability to escape the hectic everyday life we lead at home, leave the office behind, and truly rejuvenate. It is perfect for traveling with family or friends, but it is always hard to leave. Thank you for sharing your beautiful home with us - you have helped to make it another memorable trip! St. John is obviously also special to us and having guests who appreciate the island and our house has been a privilege. Thank you for your great review and please, come back.